Tipper hire is available for landscaping and construction projects from ND Brown. Regardless of the size of the project being undertaken by landscape architects, gardening, or construction contractors. We have the perfect sized vehicle to suit your site access and the quantities of materials you need to transport. 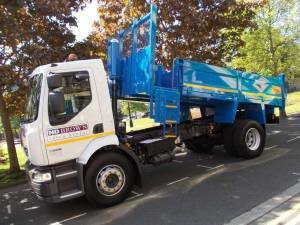 From the smallest 3.5 tonne tipper, which sits on the back of a Ford Transit cab right up to the massive 32 tonne tipper with hydraulic grab arm and bucket. Now that Spring is officially here, and the daylight hours are increasing, construction and landscaping projects around the country are kicking into life. The warmer weather and the new season brings the opportunity to clear plots of land and reshape gardens. Overgrown vegetation can be cut back and removed while hard landscaping can commence. Removing debris from your site or bringing building materials for driveways, paths, and terraces onsite is easy with our tipper hire. Now is the time of year that large scale projects within the construction industry gather pace. If you need a company which can keep up with the demands of your building project, we are the people to speak to! Wherever you are in the United Kingdom, be it in a busy city or out in the rural countryside. There is a depot located in your region so that we can deliver your tipper hire vehicle directly to you, keeping your progamme on schedule. Regeneration or new build, we have tipper hire terms to suit your timescale. Your tipper hire is waiting for you here at ND Brown. To find out more about our vehicle specifications and to discuss the short and longer term hire options available, please get in touch with us today.